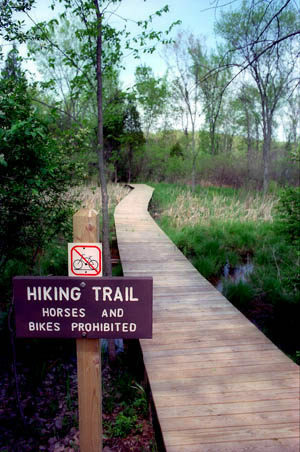 The main reason Losee Lake Trail was built in 1996 was to give a hikers a quiet place to walk in Pinckney Recreation Area. Designated for "Foot Traffic Only", the 3.5-mile trail system is an area free of two-wheelers in a state park that had become a mountain bikers' paradise. But the trail was also designed to demonstrate what a living, thriving habitat marshes and ponds are. Want to show kids some wildlife? Lead them past the wetlands along the Losee Lake Trail in the spring and they're almost guaranteed to spot a cornucopia of life in the shallow waters. The outside loop of the system makes for the longest hike and is marked by red posts. The 3.3-mile route passes both the shoreline of Losee Lake and a half dozen ponds and marshes. Two spurs, marked by blue and yellow posts, allow you to shorten the hike to 1.5 miles or 2.5 miles. Needless to say, pack along your favorite bug dope if you hike this trail from mid-June through August. 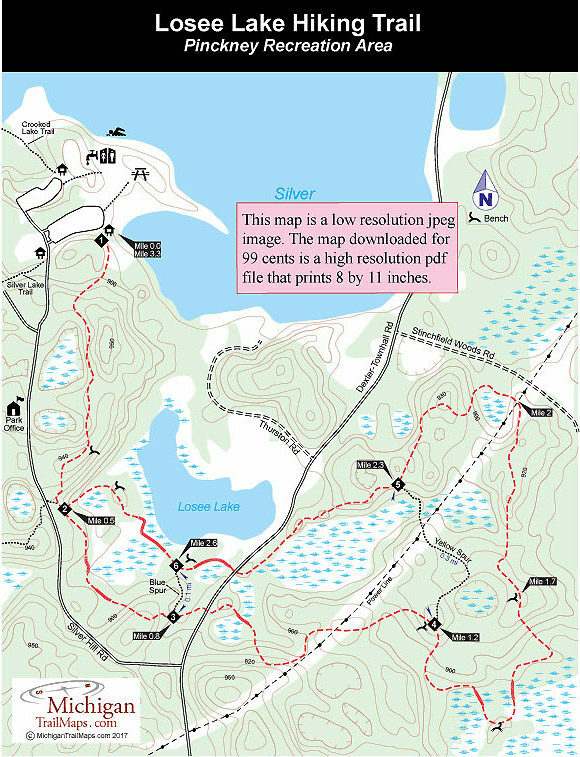 The Losee Lake trailhead is in the southeast corner of the Silver Lake day-use area's lower parking lot. From there you immediately swing past the edge of the Silver Lake and then enter the glaciated terrain that is so typical of the park. For the first half mile the trail climbs wooded hills and bottoms out at small marshes. After briefly following a two-track, you descend to post No. 2, marking a junction along the trail. Head right. The trail winds through the woods, passes post No. 3, a junction for the blue spur, and then ascends to Dexter-Townhall Road just before Mile 1. Pick up the trail on the other side as it moves into a noticeably younger forest. Within 0.3 mile you swing near a power-line corridor and then cross the corridor before arriving at post No. 4, marking the junction with the yellow spur at Mile 1.3. Head right to stay on the red loop. You quickly descend through the young forest and emerge at a bench overlooking a marshy pond. A spur leads down to the watery edge if somebody in your groups wants to search for frogs. The trail, however, stays above the marsh and remains dry, thanks to a series of boardwalks, until you re-cross the power-line corridor at Mile 2.1 and descend to another small pond. Here the trail can get a little muddy at times but in the spring and early summer the pond is another pool thriving with life. From the pond the trail climbs a hill into a more mature forest and then follows a two-track to reach post No. 5, the second junction with the yellow spur, a mile after passing the first one. Head right to follow the trail as it skirts yet another marsh and at Mile 2.7 returns to Dexter-Townhall Road. On the other side of the road is the most interesting stretch of the hike. For almost a half mile the trail skirts Losee Lake, using two long boardwalks to cross the lake's marshy south shore. Along the way you pass a pair of benches where you can sit quietly observe the waterfowl that often gathers here. Eventually you return to the first junction of the day where you head right to retrace your steps back to the trailhead in the Silver Lake day-use area. The park has both a modern and a rustic campground. Bruin Lake Campground is located on the northwest corner of the lake and features 186 modern sites, some near the water, in a partially open and partially wooded setting. Located just east of the small village of Unadilla off Kaiser Road, the campground also has a beach, swimming area and boat launch. Crooked Lake Campground has 25 rustic sites and is situated north of the Silver Lake day-use area on Silver Hill Road. The sites are on a semi-open hillside overlooking the scenic lake with a few quite near the water. There is a boat launch, but Crooked Lake is not part of the Chain-of-Lakes. Pinckney has two day-use areas, including one on the west side of Silver Lake reached from Dexter-Townhall Road by departing onto Silver Hill Road. Here the shoreline is an open grassy area with tables, grills, a store and a boat rental concession that rents out canoes, rowboats and paddleboats. In the center of the park is Halfmoon Lake with a day-use area reached from Hankerd Road. Along with a beach and swimming area, there is a large shelter that can be rented on a hill overlooking the lake, a boat launch and rental canoes. From I-94 depart at exit 159 and head north on M-52 for 6 miles to North Territorial Road. The headquarters can be reached by turning north onto Dexter-Townhall Road and then left onto Silver Hill Road for a half mile. Dexter-Townhall Road can also be reached north of Ann Arbor from US-23 by departing west on North Territorial Road (exit 49) and heading west for 12 miles. Contact the park headquarters (734-426-4913). You can reserve campsites or a mini-cabin through the Michigan State Park Central Reservation Service (800-44-PARKS; www.midnrreservations.com).